Woodraw Enriquez, 37, was left paralyzed after a bad fall in an exhibition game against Alaska in Cebu four years ago. He died on Saturday of complications from a spinal injury. 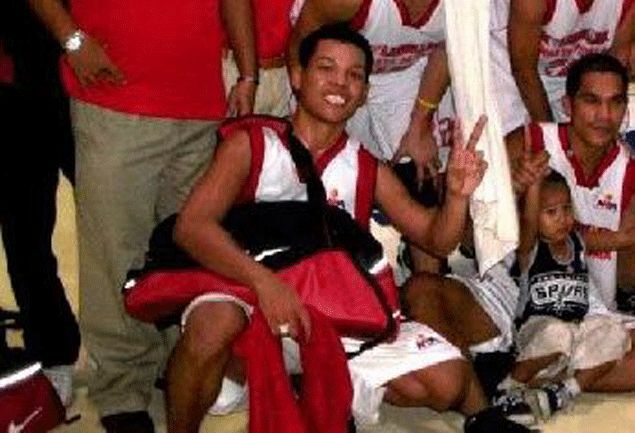 CEBU CITY - The proud Cebu basketball community is in mourning after losing one of its fiercest competitors in point guard Woodraw Enriquez, who passed away on Saturday morning due to complications from a cervical spine injury. The 5-foot-7 former playmaker of M. Lhuillier Kwarta Padala-Cebu Ninos suffered the injury in a bad fall during an exhibition game four years ago against PBA ballclub Alaska. Enriquez, the son of former Seven-Up and Filmanbank player Alfredo, was named MVP of the Liga Pilipinas in 2009 and was a late pick of former PBA ballclub Sta. Lucia Realty in the 2001 rookie draft. Although his name doesn't ring a bell among Manila fans, Enriquez is considered as some sort of a legend in the South where fans were thrilled no end by the small guard's court wizardy and guts. Enriquez is survived by wife Cathy and son ZJ, himself a budding young cage talent. He was 37. Contemporaries including current PBA standouts, former teammates, and Cebuano cage fans all expressed shock over the passing of the one-time Cebu Doctors Hospital stalwart. Following his stint with the Stallions, Enriquez suited up for MLKP-Cebu Ninos under enigmatic coach Yayoy Alcoseba where he is best remembered for his high-scoring ability and fierce competitiveness inside the court. “Woodraw is the 101 percent guy. He always gave his best whenever he played on offense and defense. You would always love to have Woodraw on your team. We would not have won all those championships without him. He was the main guy,” said former PBA player Lawrence ‘Tata’ Merced, a former assistant coach in the MLKP side. Although Woodraw was intensity personified on the court, he’s the exact opposite off it, friends said. “As a person he was really funny. He always smiled and was full of joy. Masaya kasama. He loved to sing especially his favorite song, ‘Warrior is a Child.’ I will really miss my friend, my player - Woodraw,” Merced added. Enriquez’s stellar career came to a sudden end during a game against Alaska on March 13, 2010 at the University of San Carlos gym when he drove hard to the basket and landed awkwardly after kicking out a pass in the face of Alaska big man Sonny Thoss' defense. He laid motionless for several tense minutes before he was rushed to the hospital where he was diagnosed with a spinal injury. The injury later left him paralyzed, and though he regained limited movement in his arms, he was no longer able to walk, much less regain the ability to play. Among those who offered condolences to the Enriquez family were current Ginebra star Greg Slaughter, basketball legend Mon Fernandez and former PBA player Ariel Capus, an Aceson teammate of Woodraw back in that fateful March evening. Another one who condoled with the late player’s family was former USC standout Nino Ramirez, who played for three years with Enriquez on the Ninos team. “Woodraw, or I call him ‘Woodens,’ was one of the best point guards in the country - he could defend, he could shoot, he could do everything. I watched him since I was in elementary and one of my favorite players growing up,” said Ramirez. "I played with him for three years and found out he was a great man inside and out, so fun to be with and very kind hearted. Former University of Cebu point guard Lawrence Agas, a teammate of current San Miguel Beer star June Mar Fajardo, also offered a fitting tribute to his fallen comrade. “A man who was all heart in every game he played. A man with a talent that is so hard to find in a person. He was so fast, very high basketball IQ, and very friendly. I really admired and idolized you. We will miss you,” Agas said.